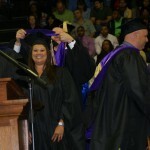 Theresa received her master’s degree in Criminal Justice in August of 2010, just 18 months after starting the program. Roman philosopher Seneca said, “Luck is what happens when preparation meets hard work.” Add passion to the equation, and it’s easy to understand why Bethel University graduate Theresa Grisham has been exceptionally “lucky” in her career. The West Tennessee native served as an Obion County Sheriff’s Deputy and dispatcher for four years, then worked in the juvenile court system for eight years, and then moved on to become Conference Coordinator for the Administrative Office of the Courts for the Tennessee Supreme Court. After four years in that position, she was offered the opportunity to serve as the Drug Courts Coordinator for the state’s Office of Criminal Justice Programs before returning to the Administrative Office of the Courts as the Education Manager, overseeing all the education for the Tennessee Judiciary. Altogether, she worked for the Administrative Office of the Courts for a total of eight years. Today, Theresa serves as Deputy Director for the Tennessee Trial Lawyers Association, where she oversees the legislative, educational and administrative duties for approximately 800 individual members. It’s the pinnacle of a professional progression that she says was fueled by passion. This entry was posted in News and Information on February 11, 2016 by bethelu.